Eight years ago tonight, I finally went on a date with that cute TA from one of my grad school classes. As soon as I saw him on my first day of class, something told me that I was going to marry him. I hadn’t even known his name yet, but I knew he was going to be my husband. Of course, I didn’t fill him in on this until much later. Needless to say, I was nervous all day. I can remember the knock on the apartment door like it was yesterday. My heart immediately jumped into my throat, suddenly panicky about introducing him to my roommates. I was living with my best friends, and they had seen the more-than-interesting track record I had. They also knew how much I liked this guy since I talked about him non-stop. I remember really wanting them to like him and vice versa. It was kind of like bringing your first boyfriend home for your parents to meet. Everything went fine, and we went to dinner at Chili’s, where I hardly touched my chicken soft tacos because I was suddenly really self-conscious about eating in front of him, even though I had stuffed my face in class on more than one occasion while he was looking. The conversation was easy, just as always, and I think I had made sure to mention my trip to Israel so that I could invite him up to see my pictures after the movie. Then he took me to see Monsters, Inc. (insert awww), which I enjoyed (but not nearly as much as the second time around when my heart wasn’t jumping out of my chest, waiting for him to hold my hand). 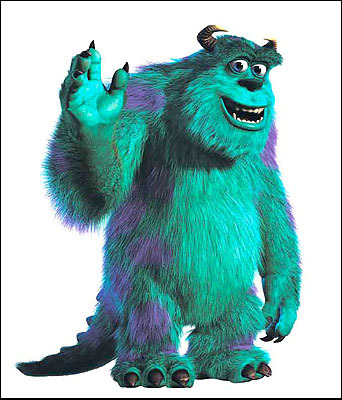 Later in the relationship, when I started having my usual commitment freak-out, he gave me a Sully stuffed animal to remind me that even though he (the relationship) might appear scary, he (it) wasn’t (insert another awww). He humored me after the movie, sitting through at least ten envelopes of Israel pictures (a sign that he really liked me – when you’ve seen one picture of the desert, you’ve seen them all) before finally working up the nerve to kiss me. And the rest is history. As I think about this December and all the activities we have scheduled for this month, I have to pause and give thanks for today from eight years ago. Because without that date, none of those things would be happening. Jenny is participating in a Season of Giving. Check it out! Amy and Kati are hosting a Two Florida Girls giveaway. Such cute holiday gifts! And I wanted to clarify: I did not design my blog header (all I did was add some holiday elements to it, thanks to Photoshop). The credit for the amazing gator goes to my dear friend, Mike, and the entire blog design is the work of Blog Candy Designs. You two are so gay for each other. Congrats on eight awesome years! This is such a sweet post! Thanks for sharing your story with me (us). I hope I get a chance to meet this great guy one day – though I think he's the lucky one! 🙂 Enjoy your honey!